On June 27, 1999 I did a loop ride to Oakridge. The only other time I've rode to Oakridge was several years ago when I went up Brice Creek, over the mountains, and came back Hwy 58. I tried a different way this time as Hwy 58 is not pleasant to ride on. I started the same as the previous time, up over Garoutte, past Dorena Lake to Culp Creek. Then I left my previous route, turning left onto the Lower Layng Creek road. After about a mile this yeilds a nice view of Wildwood Falls. Several miles later it runs into Layng Creek road proper (Forest road 17). This little valley was for quite some time the sole water source for the city of Cottage Grove. It still provides about half the water for the city. I had never been beyond the end of the pavement on this road before. It proved to be quite rideable, not too steep, and not too much loose gravel. There was a sprinkling of the white irises along the side of the road. They come out later up there than they do at lower elevations. After four and a half miles of this, I reached the Patterson Saddle, elevation 3200 feet. A sign indicated that the road ahead reached Hwy 58 in 5 miles. Instead, I turned right onto road 1714. This road is a bit steeper than road 17, but has even less loose gravel. It climbs quickly above the trees, giving a nice view of the Layng Creek valley. After about three miles road 5847 comes into road 1714 on the left at an elevation of about 4000 feet. Several miles down road 5847 I got this view of The Sisters. A bit further I noticed a patch of beargrass in bloom alongside the road. Further still, around a bend, the road was a bit washed out, though still rideable on a bike. About a quarter of a mile further, where the road to Kreuger Rock takes off, was a sign indicating that the road I had just come down was closed. Gee, there wasn't a sign at the top! After reaching Hwy 58, I turned right towards Oakridge. I stopped at the Greenwater rest area just past Oakridge to refill my water bottles. Then, a couple miles further, I turned right towards the Hills Creek lake, after another mile another right onto road 21, and after yet another mile, another right onto road 2102. This road is not too steep, but after all the climbing that I'd already done, seemed a bit worse than it is. This is one of the roads that the Tour de Lane uses, so it can't be all that bad. 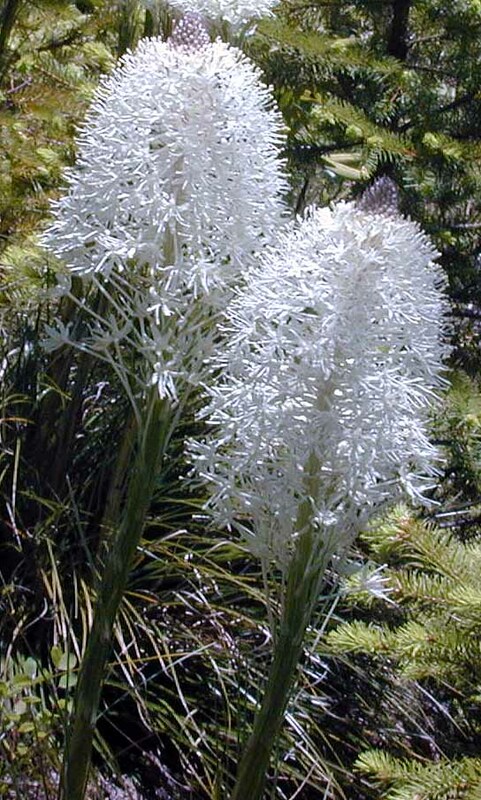 After climbing above 2000 feet there was a lot of beargrass along the road, compared to just the one clump I saw on 5847. In nine miles it climbs to about 3800 feet, then ends at road 5850. 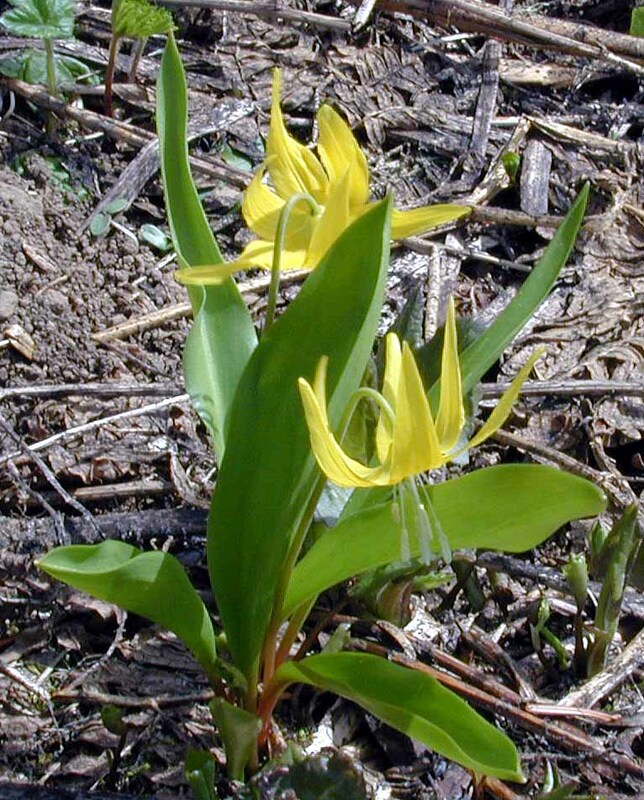 A left onto 5850 took me up to 4800 feet at Holland Meadows where I saw lots of yellow fawn lilies and trillium. Off in the distance I could see Bohemia and Fairview peaks. A few miles further, road 17 takes off on the right, and drops down to Brice Creek after four miles of ok gravel road. From there it was an easy 26 miles more to home. I rode One hunred one miles, climbed 8900 feet, and had no mechanical problems, in spite of riding on about twenty miles of gravel roads.